Welcome bonus: Up to $1600 matched over four deposits. Games: Just one keno title from Microgaming, among a huge catalogue of pokies, progressives, table titles, video poker, and more. All Slots Casino offers just one keno title, since the site is powered solely by Microgaming. However, this title offers traditional gameplay and can be accessed via your browser (Chrome, Safari, Firefox, etc.,) or via the downloadable software. While the site, established in 2000, is named All Slots Casino it offers an array of casino titles – not just the pokies. These include table games such as blackjack, roulette, poker, craps, and more, as well as video poker and other casual games along with the single keno variant we mentioned above. All Slots Casino offers a variety of promotions and keno can actually be used to clear and bonus terms and conditions attached, such as the wagering requirements. You need to make the second and third deposits within seven days of opting in when making the first deposit, while each bonus needs to be wagered 30 times before it can be released as real cash – otherwise it sits in your account as bonus cash which can be used but not withdrawn. Every wager you make on the keno title contributes 100% to the wagering requirements, so you can clear the bonus as quick as you would with the pokies (these also contribute 100%). As soon as you start wagering real money at All Slots Casino you will become a member of the loyalty program offered. There are five tiers, including Bronze, Silver, Gold, Platinum, and Diamond, with players starting off on the Bronze status. You can earn points by playing your favourite game, including keno as it earns one point with every $10 wagered (best possible option alongside the pokies), while other games require more to be wagered per point, for example poker requires $20 per point. Climb your way up the tiers to earn amazing rewards and even an invitation to the VIP club where you will receive VIP bonuses and support. There are regular promotions to reward players as you play, such as promotions where you can accrue loyalty points to earn rewards – keno is a great game to play as it can earn you points the quickest – or free spins, and other amazing bonuses. All Slots Casino is a Microgaming powered online casino and therefore offers both a downloadable casino where you install software to your device (only available on PCs with a lot of storage) or an instant play casino accessed via your browser. The downloadable casino offers the full casino catalogue but for keno players this isn’t important as there is just one keno title at All Slots and it is available on both platforms. In terms of the other titles, there are less pokies but these tend to be the older pokies which were first available when Microgaming casinos were downloadable only, as well as some table titles you can’t access on the no-download casino such as Casino War. If you have a Mac or a PC with limited storage the browser play version still offers a substantial casino catalogue with keno. The instant play and downloadable casino layouts are quite different, but both are easy to navigate. The downloadable platform offers a games lobby in a separate window where you’ll find the games grouped in an array of categories including ‘New Games’, ‘Favourites’, ‘Blackjack’, ‘More Tables’, ‘Tournament’, ‘Jackpots’, ‘Classic Slots’, ‘Video Slots’, ‘Video Poker’, and ‘Other Games’. You will find the keno title under the ‘Other Games’ category. 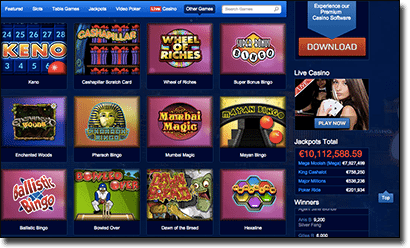 The instant play casino is offered via your browser and you simply click on the menu panels including ‘Featured Games’, ‘Slots’, ‘Table Games’, ‘Jackpots’, ‘Video Poker’, ‘Live Casino’ and ‘Other Games’ to navigate your way around the catalgoue. You will once again find Keno under the ‘Other Games’ category. Both offer search bars to find the title you are after instantly, perfect for keno players after the version offered here. As we’ve mentioned, there’s just one keno title available at All Slots Casino developed by the top leading software developer. Microgaming. Microgaming offers the best traditional keno on the web, and what’s more the house edge is lower than what you’d find at a land-based venue (such as a pub, club, or land-based casino) and you can play at your own pace. Players begin by picking their bet size, from a minimum of 1 coin up to a maximum of 100 coins. You can pick up to 15 numbers out of 80 and these will be highlighted in blue as you select them. Once you are happy with your numbers and your wager you are required to press ‘Play’. You can click ‘Clear’ if you want to re-pick too. The automatic keno machine will then shoot out 20 numbers and if any number matches it will be highlighted in red and the more you hit, the more you win. The amount you win ultimately comes down to how many numbers you chose to play and how many you matched correctly. For example, playing just one number will pay out three coins if you match it correctly, but if you select six numbers and only get one number it will pay 0.5 coins. However, if you pick six numbers again and get five correct you will win 30 coins. 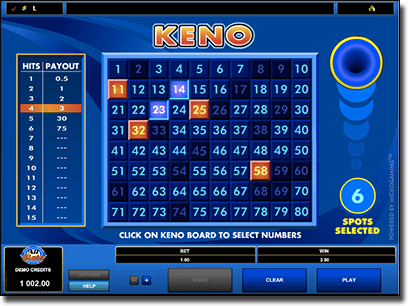 The paytable is to the left of keno board and will detail clearly how much you will be paid – another handy feature to playing keno online. What’s more, the maximum you can win is 10,000 coins won by selecting 15 numbers and getting all of these correct – though the odds of doing so are poor. Unfortunately, keno isn’t available on the mobile All Slots site so you can’t play it here on smartphones and tablet. However, you can play mobile progressives, pokies, table titles, and more on your Apple, Android, Windows, Blackberry and other portable device here instead. If you want to play other casino games while potentially winning big on keno you can at All Slots casino with an array of Microgaming games including pokies, blackjack, roulette, craps, poker, Sic Bo, bingo, scratch cards, and more. All Slots have a large number of payment methods meaning you are bound to find at least one to fund your account to get playing real money keno. Governed by the Malta Gaming Authority (MGA) we can be sure All Slots is a secure and fair online casino – these credentials mean the site has undergone an investigation into their operations and passed with flying colours. All Slots is also regularly audited by eCOGRA, a testing agency which provides reports on the fairness and randomness of the games offered – allowing for 100% transparency to players. Sign up to AllSlotsCasino.com today for $1600 in welcome bonus cash to use on some of the best online keno games available for Australian punters.